Our Story — St Elmo Brewing Co. So what are we about, anyway? St Elmo, TX was founded in 1875. It boasted a post office and later a school, which remains today. St Elmo Brewing Company was started in 2016 by two dudes that love beer. They love sharing it, drinking it, and most of all, making it. St Elmo was started by Tim Bullock and Bryan Winslow. We aren’t beer bigots, we like ALL the beer. Every style of beer has it’s special place in life. St Elmo is our effort to take you to all of those in places, in your mouth. At St Elmo, we’re excited to engage with our neighbors and break down barriers between brewer and drinker. We chose the name St. Elmo for a very important reason. Our location. We are very excited to grow and be a part of The Yard and the St. Elmo neighborhood. With tons of great neighbors like Music Lab, South Austin Brewery, Still Austin, Spokesman, and Juiceland, we hope to bring the heat to an already creative block. At St Elmo, we’re excited to engage with our neighbors and break down barriers between brewer and drinker. Our brewhouse is open to the bar for a reason. Come ask us a question and help us make better beer! Everyday is better with beer. 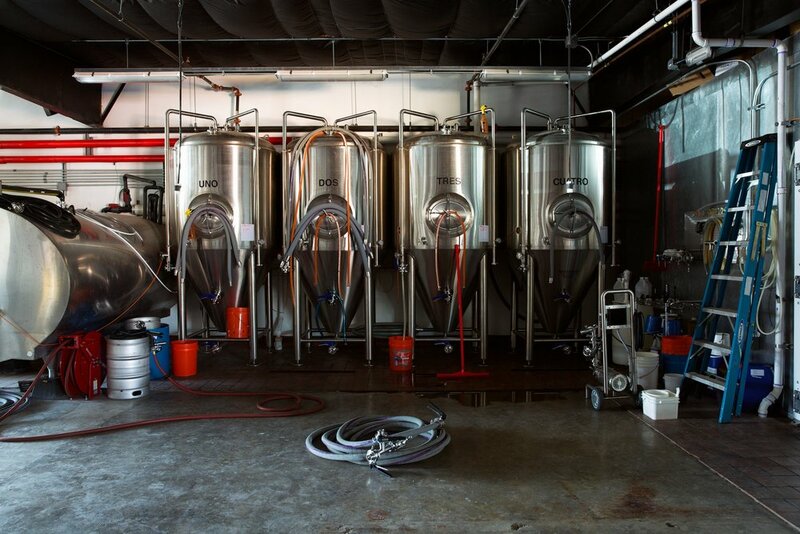 Our 15bbl brewhouse, helmed by Bryan, will be continually pumping out fresh, new recipes. A rotating menu means there will always be something different at St Elmo. Our bar, beer hall, and beer garden are great places to spend your day. We’re open six days a week. And great beer isn’t the only option. We also have pour-over coffee, housemade mineral water, and soda. And food! Our resident food truck, Soursop, serves amazing Asian drinking food: we’re talking fatty pork, thai chicken wings, La Koreanita burger, etc. A clean, refreshing Kolsch is hard to beat in the Texas heat. Pale Ale that explodes with zest and fruit is a fantastic way to relax with friends. We love a funky Saison on a cool spring evening. What we’re getting at is, we love all the beer!